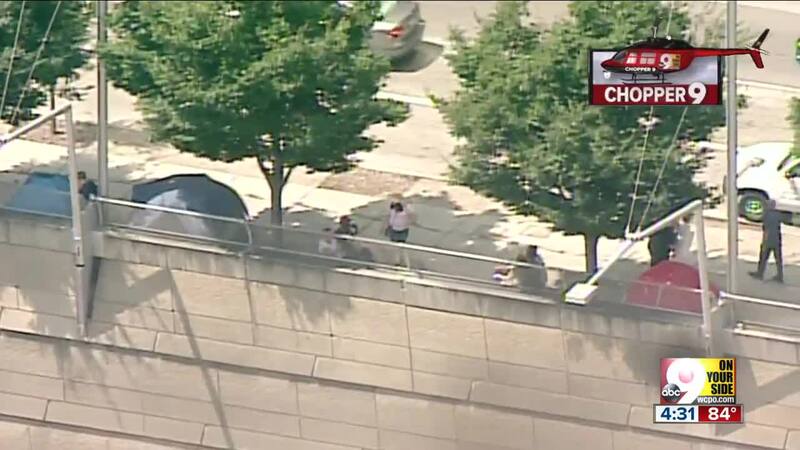 CINCINNATI -- People began re-pitching their tents on Third Street after an hour-long cleanup Friday. 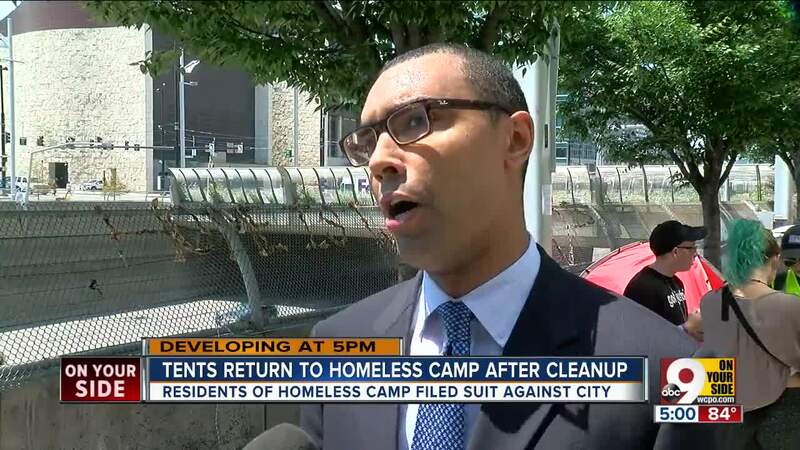 City officials had intended to permanently clear out the tent city, but a federal lawsuit filed Friday morning stopped that from happening, for now. Mayor John Cranley said in a statement he will work with Hamilton County Prosecutor Joe Deters to "pursue all strategies to end" the tent cities for good. "It is unacceptable that individuals and activists continue to illegally camp with tents in the right-of-way," he wrote. "This presents a clear and present health and safety hazard to homeless individuals and the general public. ... Prosecutor Deters will be filing actions in state court and we will file motions in federal court." 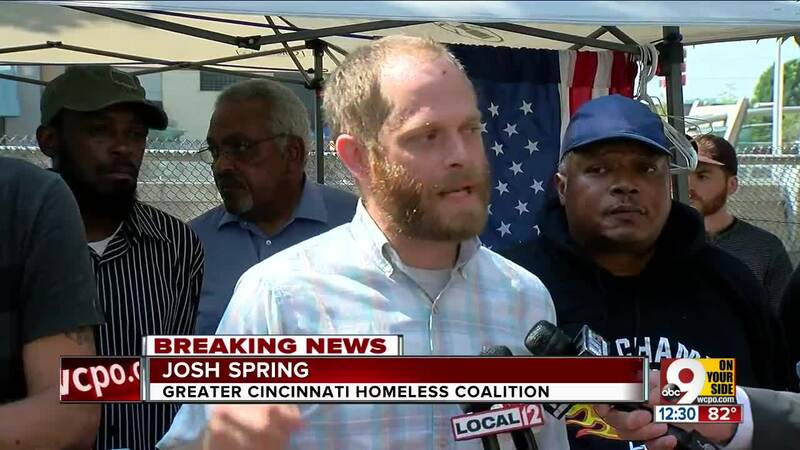 In a motion, the Greater Cincinnati Homeless Coalition sought to have a judge block the city from kicking people experiencing homelessness from the camp on Third Street between Main and Walnut. However, Judge Timothy Black denied the request hours after it was filed, according to Josh Spring, CEO of the Coalition. That decision allowed the city to clear out and clean up the area. City officials have called the camp a "public health hazard." 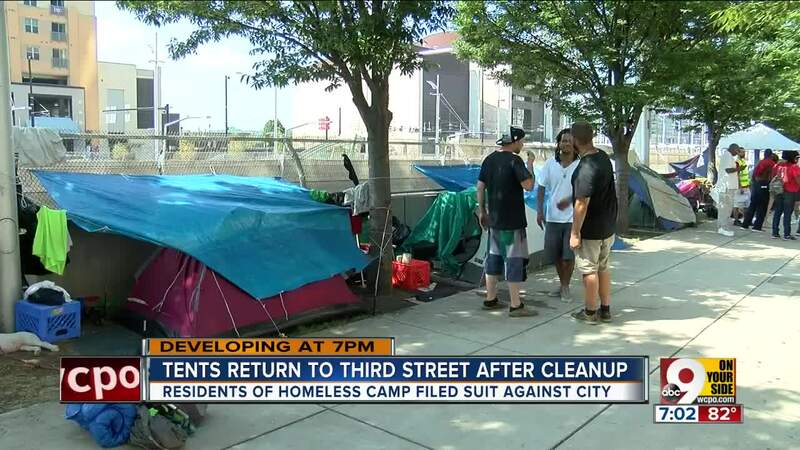 There were more than a dozen tents pitched along the stretch of Third Street Friday morning. People staying there packed up their belongings ahead of the city's 2 p.m. deadline, but some of them just moved around the corner and set up on Walnut between Third and Second while city workers removed trash and cleaned the sidewalk. Police Chief Eliot Isaac and several officers oversaw the events on Third Street Friday afternoon. 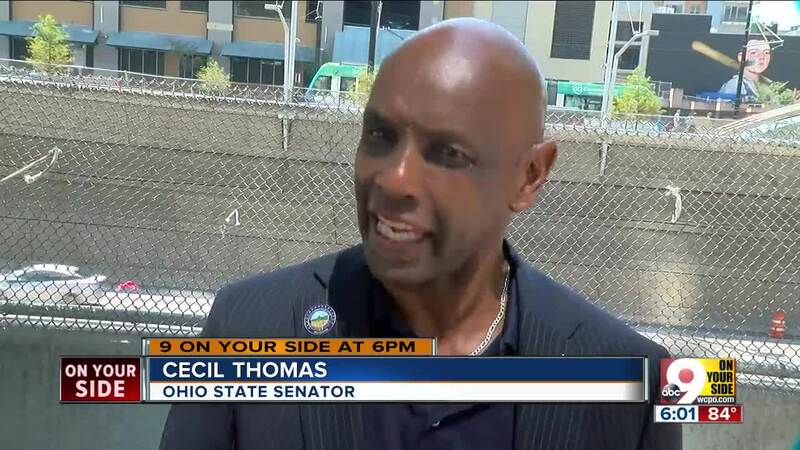 "I'm here today to make sure that everybody's safe, everybody's treated with dignity and respect," Isaac said. "I'm here to support my guys and let them know I stand with them, and help public services so they can do the work that needs to be done." The tents will be back for the foreseeable future. The Homeless Coalition's challenge still has to be heard in federal court. Joe Phillips has struggled with homelessness for six or seven years. That's why he's living in the tent city along Third Street. 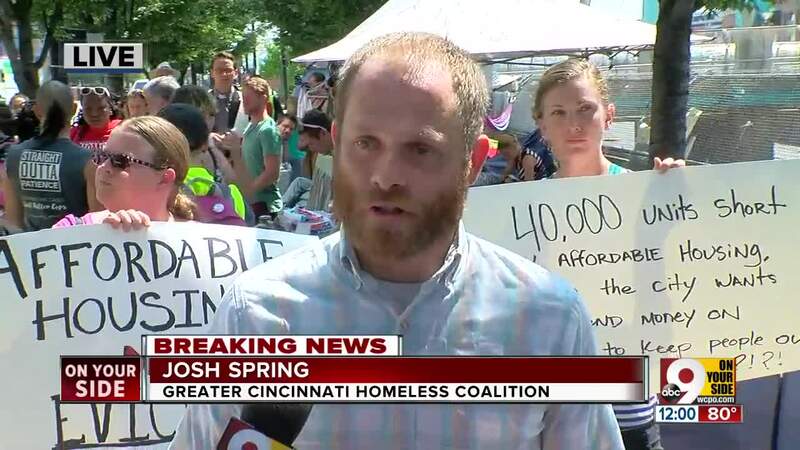 It's also why his name is on the Greater Cincinnati Homeless Coalition's lawsuit against the city. "I've even had the money and the opportunity to have my own home, but I'm a three-time felon," he said. Phillips said he tried to find affordable housing, but has been turned away. "I've been told specifically, 'Hey man, you seem like a good guy, I'd live to rent to you, but you have a record, which means trouble, so I can't rent to you,'" Phillips said. The Homeless Coalition's lawsuit alleges the city is violating residents' constitutional rights. "It's our position that our clients are exercising their First Amendment rights to engage in political speech in a public forum, calling attention to our city's affordable housing crisis," Allen said. In a memo to the mayor and council, Acting City Manager Patrick Duhaney wrote that the city's "primary concern is the health and safety of all residents and visitors." The city will continue to focus on cleaning and sanitizing the area along Third Street, according to the memo. "The City recognizes that housing and homelessness are significant issues," Duhaney wrote. "The City has taken necessary and significant steps to provide opportunities for individuals to receive needed help. However, the City has a duty to protect its right of way and must ensure safe and sanitary conditions for everyone." The other homeless camp between Fort Washington Way and One Lytle Place will stay in its current location for now, too. "Until we get serious about solving these problems — until we have actual solutions — we must not punish people for trying to live," Spring said. A recent survey of Downtown residents and business owners showed concern for the city's image due to the camp. Now the Downtown Residence Council is asking the city to be included in the discussions moving forward that involve the camps. "The trouble is, we keep hearing about 'taskforce,' and that's been going on a couple years and that seems to evaporate," said Sue Byrom with the Downtown Residence Council. "So we want a solution." The homeless advocacy group Maslow's Army has been looking for solutions for the people living in these camps. They've been involved as the city cleared people out from an earlier camp under the Third and Plum overpass and continued to offer what they can during the cleanup Friday, setting up at the corner of Fifth and Main. Maslow's Army is trying to provide people experiencing homelessness with food, clothes and other essential items. "We want them to be productive members of society, and we do everything we can," said Susan Landis, co-founder of Maslow's Army. "Part of our street outreach on Sunday is meeting their basic needs in hopes that they will reach out during the week and provide them with the peer support and connecting them to resources." People on various sides of the issue say that permanent housing — not just shelters — would go a long way toward solving a problem. "Give us a job, an ID, birth certificate, a Social Security card, and you won't see me," said homeless camp resident Aaron Bickett. "You'll see me in a work outfit."